Recording into Audacity can be fun and easy. But organizing the projects, especially if you have many episodes, can seem overwhelming. Here are several to help you keep things organized. Whenever I say, “project,” this can also apply to a podcast episode. This topic was inspired by John Wilkerson from The Wired Homeschool. A great podcast starts with great planning, even for “off-the-cuff” comedy. Inspiration can hit when you're falling asleep, driving on your commute, or even sitting in church. If you don't record at least the essence of this idea, you'll lose it. I'm a fan of productivity tools that actually help me be productive. A lot of people swear by Evernote, but I felt it was far too limited. Instead, I use SpringPad to capture pictures, audio files, notes, web links, and more for all of my projects. I think Google Docs has the best real-time document collaboration! Use this for planning your podcast with cohosts and taking notes live while recording. Writing your shownotes for publication before you record provides a great outline for recording and helps you stay on topic. This also significantly reduces the time between recording and publishing. 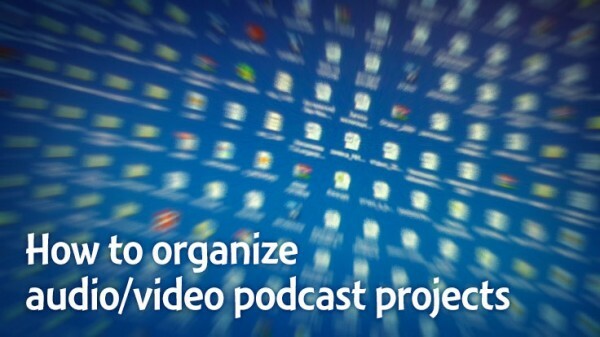 Organizing your audio or video project is crucial. This also makes archiving and later retrieval much easier. Start each project by making a folder just for it. If you have episodic content, create subfolders for each episode. planning notes (if not online). or anything else you consistently use across projects. However you record your audio or video, keep that raw recording as a backup. I've had several podcast episodes where I edited, processed, published, and then discovered a significant error that I could only fix by going back to my original recording. If the uncompressed WAV files are too big, consider converting them to mono if you'll never need the stereo. Even if you completely trust your media host (like LibSyn, Blubrry, or someone else), keep your own copy of the final file. This makes it easy for you to share, relisten, reference, or re-upload the file in the future. This is especially important for video projects where the encoding can take a long time. You can delete transitional files, like a finalized WAV that you use for encoding to MP3 (such as Audacity to iTunes to MP3). Audio and video editing programs are different. But if you learn how to organize your projects within the programs, you'll save yourself a lot of time and make things easier. I still use Audacity to edit my audio podcasts, so I'll use this as my primary example. As soon as you get more than one audio or video track, it's possible to be confused by what's what. Name your tracks in logical, flexible ways to help you. Here are some examples. Voice—just you or the mixed recording of your and your cohosts. Sounds—for intro/outro music, sound effects, or anything other than voices. [First name], [First name], [First name]—if you record multiple people in separate tracks, name their tracks by their names so you can instantly see whose audio or video you're editing. Guest/voicemail—call-ins or voicemail recordings will likely be a different quality than your own. Keeping these on a separate track makes processing easier and more specific. Background—music, video, pictures, or anything you consider “background” in your project. In Audacity, click on the Track Control Panel's drop-down menu and click “Name…” to rename the track. In addition to naming your tracks, your vertical stacking will also help organize and simplify. I order my tracks in “priority”: voices on the top track(s), sounds and background underneath. In Audacity, simply click on the Track Control Panel and drag the track vertically to re-order it. In a multitrack project, removing time (whether audio or silence) from one track will affect the alignment with everything else. Learn your editing program's method for preventing this by enabling a track synchronization lock, or making your selection across multiple tracks. Enable Sync-Lock Track to make any timing-related changes in one track affect all other tracks. Drag your selection vertically across all tracks you want to affect. Split-delete (Cmd-Opt-K on OS X, Ctrl-Alt-K on Windows) audio to prevent it from affecting the current track or any other tracks. Some editing programs allow you to create a “label track” that can hold annotations at points along your timeline. This can help you find locations in larger projects. 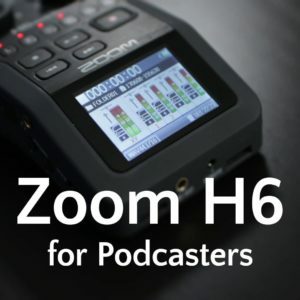 Some audio recorders, such as the Zoom H4n (what I use), allow you to create a mark at a certain time in your recording. More advanced apps can read these marks like chapters or bookmarks. Unfortunately, Audacity doesn't support this. Great tips. I have been wondering which files I do and do not need to keep. Am amazed how much space on my 1 TB Seagate external HD I’ve filled with podcast files. Regarding work flow I find it helpful to not write out show notes before recording. Instead I use Wunderlist (www.wunderlist.com it is free too) to make a list of topics. I order them chronologically and can share my lists with co-hosts or any other collaborators. While recording I have Wunderlist open on my iPad so I can see the list in front of me. I record with my Blue Snowball mic (yep, I got a Ringer shockmount too), and can use the iPad to noiselessly mark which items I’ve covered. Having the list in front of me helps me to better manage my time. It also makes writing my show notes as a breeze. In the past I would write out topics, ideas, etc, in a notebook and then create show notes from that. Even that was a step up from the old days when I had to listen to the recording to write my show notes. 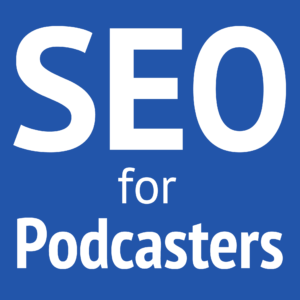 A podcast network I am affiliated with uses Google Docs for us editors (it is a blog that now has a network). I like Google Docs for the ease in editing files while on conference calls with the owner and other editor. It definitely allows users to expand as much as they’d like on content. Wunderlist, on the other hand, works best when you get to the essence of the idea. Listing topics, assigning dates, and then easily sharing the list with other users or even the public. I heard about the app from another show and surprised myself by how much I love the app. Not only am I using it for podcasting but also in other areas such as household tasks and at work. I have Evernote on my iPad but never got into the habit of using it. Sounds like Springpad is worth investigating. Yes, I used Wunderlist for a while, too. I just didn’t like that my todos were in one app, and other things I wanted to remember in another. Also, Wunderlist doesn’t have great notifications. That’s true. I don’t even recall if it has push notifications or not. I tend to use it to create a list of topics. Then I open it on the iPad before I record so I have it front of me. The poor notifications doesn’t negatively impact me this way. 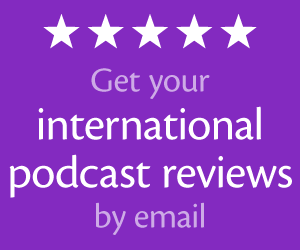 A very helpful episode Daniel – KUDOS! You mentioned giving other suggestions on productivity apps, so here’s mine. I use NOZBE – http://webapp.nozbe.com/a-careygreen (affiliate link) – it’s based on the Getting Things Done philosophies, which I’ve found very helpful in my own life and workflow. I tried Evernote for a bit but got tired of the limitations. Then I found Nozbe and enjoy it a lot. That’s cool! I like their integration with other services, like Google Calendar and Dropbox. For a while, I was using Apollo Project, which is like a much-better designed Basecamp. But it was out of my price range. I’m still looking for better tools to help me track and manage my projects, so I’ll consider Nozbe! As a technical trainer for 20+ years, you would be amazed at how the basic skills of file management are missing. Many people started using computers, and we just started filing everything in the “My Documents” folder. This is like having a filing cabinet with one folder in it. Take the time to install some organization and you will save time looking for documents later. It’s the simplest things that can often help the best. I always create my show notes and share them with the person I am interviewing. If I am sharing the notes with a non google docs user, which for me is most of the time, I download my show notes in PDF format. I have found most of my guests are able to read a PDF file no matter what computer they are using. As a matter of fact, I no longer ask the guest what type of computer they have or if they use google docs. I simple send them the PDF file. Of course if you where ever on my show I would share the document in google docs. But since my podcast is about Aviation Careers I don’t think that will be happening any time in the near future; unless I can convince you to change careers. Keep bringing us great content! I always look forward to seeing your show when I open iTunes. PDF is a great idea! I see a lot of people handing around .docx files, but I don’t have Office on my Mac and .docx looks weird in some programs sometimes.